It’s fancy dress season and what better costume to wear than one you’ve made yourself? More accurately, one you’ve made famous (to a certain extent) yourself. 10 years ago 70’s reject Jake Cop patrolled the streets of L.A. looking for his arch nemesis Sanchez, this week he’ll be staggering the streets of Stockport looking for the bar. With only 24 hours to find the bar, Jake’s under a tough deadline, or it’s his piece and shield. Expect photos from the night and drunken tales if they can be recalled to appear here this weekend. 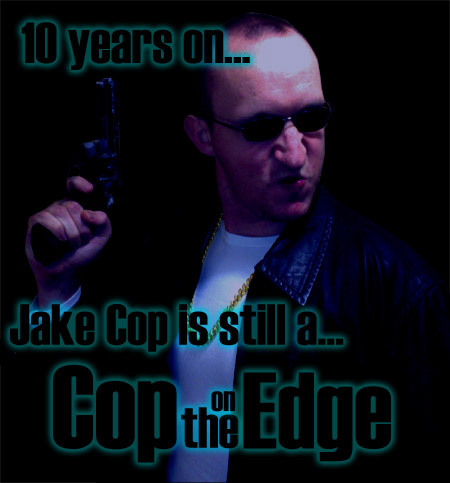 For a complete history of Jake Cop visit the official website www.cotenfilms.com. Previous PostJo Whiley Must Die SlowlyNext PostWhat exactly is ‘British’ about British Telecom?